I am missing the beauty of the date harvest in Morocco this year. 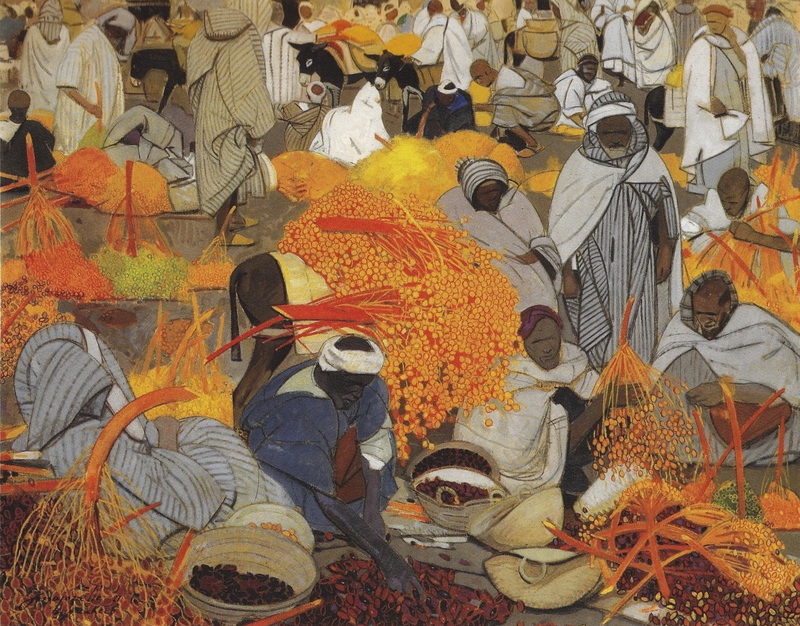 The colours must be seen to be believed and are so stunningly captured by the French artist Jacques Majorelle in his 1921 portrayal of the Date Market in Marrakech, one of the few paintings I truly lust after. The oases of the great river valleys in Southern Morocco, the Draa, Dades and Ziz, stretch for miles and are the main livelihood of the local inhabitants. The succulent medjool date (medjhoul in Moroccan Arabic) originated in Morocco and is also now widely cultivated in California and the Jordan Valley – our main source of this delectable fruit. In 2005 seeds of the Judean date, a cultivar extinct for almost 2000 years, were found by Israeli archaeologists on the site of Herod’s palace on the fortress of Masada. Scientists at the Arava Institute in the Negev managed to germinate one of the seeds and the resulting plant, named Methusaleh after the oldest man mentioned in the Bible, is now about two metres tall. Following an ancient Arab Tradition, La Maison Bleue in Fes offers arriving guests dates filled with roasted almonds together with a bowl of orange blossom scented milk. This sets the scene for the peaceful, fragrant stay in this haven of luxury in the ancient medina of Fes. Dates are the first food consumed to break the fast each evening during the month of Ramadan and are the traditional accompaniment to Harira soup, served at the traditional Ramadan Ftour or breakfast.